Rega Planar 1 review | What Hi-Fi? In an era of change, not even Rega’s best-selling turntable is immune to the desire for a fresh approach. Yet, despite a considerable list of tweaks to the original Planar 1, the British company’s signature sound is definitely going to remain. And with the new Rega Planar 1, change is unquestionably positive. It begins with the new RB110 tone arm, with precision bearings and automatic bias adjustment; combined with a tracking weight whose ideal position is already marked for you, it means you can set up faster than a cabinet minister’s resignation. In fact, pretty much everything you see has undergone some form of modification, including the Thermoset, gloss-laminated plinth, with its on/off switch hiding beneath the front left corner. Our test copy is a sleek white, but the black finish is equally tidy; devotees to sharp lines and ergonomic design are likely to be impressed. Even the platter has a higher mass and enhanced flywheel effect for improved speed stability. There are also hand-me-downs from higher up the range. The Rega Carbon cartridge is fitted as standard, and this is the first of Rega’s entry-level turntables to house a 24v synchronous AC motor with an aluminium pulley, for example. The company claims it offers low noise and, again, better speed stability. If you are still reading, it is likely to have taken you longer to reach this point than it did for us to begin playing our first record, The Tallest Man On Earth’s Dark Bird Is Home. The Rega’s claim to be plug-in-and-play is no pretence. We’ve long admired Rega’s spry presentation and it welcomes us like an old friend as Kristian Matsson waves his hand over the album’s opening chords. This is not an entry-level amount of detail; the roomy-sounding acoustic guitar is complimented by the reverb in Matsson’s first vocal line; the distinction in treatment of each part is clearly audible, setting the vocal apart like a bird gliding low but parallel to the ground. This combination of accuracy and a skill for knitting together the different strands is even better displayed a few minutes later as a group vocal lusciously shrouds the closing phrases. Some turntable manufacturers could be said to have a tendency for playing up to what you might describe as analogue warmth, but not Rega, so you needn’t worry about being left wanting for body in this sound. Besides, if you can render a record so faithfully as the Planar 1 does, that warmth of its rivals begins to feel like the sonic counterpart of dousing your Christmas dinner in tomato ketchup. When the record receives its adrenaline shot with Darkness Of The Dream, the Planar 1 turntable is more than capable of snapping at its heels. The combination of energy and solidity resonates superbly with the Tom Petty/Waterboys-infused drive of this track, as it does when supporting the album’s more delicate numbers. But it takes a comparison with the excellent Pro-Ject Essential II to truly appreciate this turntable. We are admirers of Pro-Ject’s indiscriminate signature sound, and are more than able to enjoy the warmth the Essential II brings to our copy of Django Reinhardt’s Djangology. Yet, lift the disc over to the Planar 1, and suddenly Rega makes its competitor’s rendition sound like a rehearsal. Pro-Ject’s timing is by no means lazy, but it is made to appear so by the Planar 1; there’s a smoothness to the way Reinhardt fingers his notes on the former, but it is only when heard on the latter you discover the track’s intensity. That precision translates, and finally we are able to hear the distinction between those notes stroked and those punished with a firm hand. The Essential II by no means leaves the duel red faced, and we must keep in mind our reference system - far beyond anything these turntables are likely to find as partners - is exposing these discrepancies with an inordinate amount of transparency, but it is hard to come to any other conclusion than that Rega have raised the bar here in almost every respect. Probably the finest test of any product is how long we use it once having already come to our conclusion. In this case, the Planar 1 is still playing and proving it can turn its hand to Dmitri Shostakovich as adeptly as it does Toots and the Maytals or Charlie Parker. Even as an entry-level turntable, this is the kind of player that could feasibly be the last of your system’s components you’d feel necessary to upgrade. 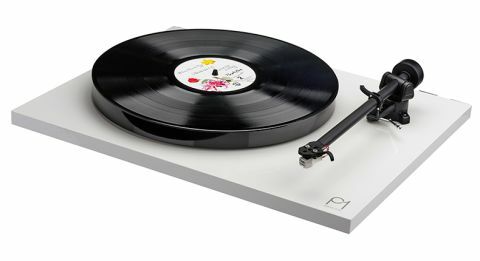 However, the availability of a Performance Pack add-on for £85, comprising of Rega’s Bias 2 moving magnet cartridge, upgrade drive belt and 100 per cent natural wool turntable mat (you’ll have to fit these yourself), means that when it does come time to upgrade you needn’t immediately shell out £500 for something such as the Rega RP3/Elys 2. In these times bereft of certainty, there is far worse you could do than to close the curtains, settle in your favourite armchair and spin a few records on the new Rega Planar 1.